Our product range includes a wide range of automatic brick making machine, brick production line, hydraulic multi brick making machine, automatic hydraulic brick block & paver machine, hydraulic brick making machine and chirag fully automatic brick making machine. The whole process is finished automatically. Such as raw material ratio, block forming, pallet feeding, pallet-block separated, pallet cleaning, pallet returning etc. The workers just need to control the whole system easily by surveiling. Our organization offers an exclusive range of Hydraulic Multi Brick Making Machine to our clients,These machines are designed from quality components and are extensively used in construction and civil industries. Our valuable clients can also avail these machines in customized forms as per their specifications. Moreover, our range is highly appreciated by our clients for the exclusive designs, quality and durability features. Our esteemed clients can avail an exclusive range of AutomaticHydraulicBrick,BlockandPaverMachine, which is designed and developed by using ultra-modern technology. Our range is designed with precision and provides long service life. These are used for paving blocks in footpath, car parking and other places. We provide these paver machines with a broad spectrum of paver machines for brick & block making. We offer our range at cost efficient prices. Chirag Fully Automatic Brick Making Machine Highly productive moulding device, which consists 360 rotating and compulsory feeding of raw materials, platform vibrating and compression shaping, greatly improves the cycle time. The finished blocks are of good shape and high quality. Chirag Fully Automatic Brick Making Machine The moulds are changeable, and it is able to produce various kind of blocks,bricks,interlocks, pavers and kerbstones in different types, sizes, shapes, and colour layers. Chirag Semi Automatic Brick Machines Highly productive moulding device, which consists 360 rotating and compulsory feeding of raw materials, platform vibrating and compression shaping, greatly improves the cycle time. The finished blocks are of good shape and high quality. 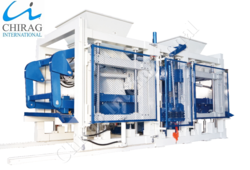 Chirag Semi Automatic Brick Machines The moulds are changeable, and it is able to produce various kind of blocks,bricks,interlocks, pavers and kerbstones in different types, sizes, shapes, and colour layers. Chirag Multifunction Brick Making Machine Our machines, with harmonic cooperation between mechanical, electrical and hydraulic machines functions, guarantees a reliable and high production output of concrete products. 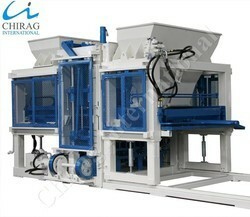 Chirag Multifunction Brick Making Machine With face mix device, its able to produce pavers with colour layer. Chirag Multi Raw Material Brick Making Machines Highly productive moulding device, which consists 360 rotating and compulsory feeding of raw materials, platform vibrating and compression shaping, greatly improves the cycle time. The finished blocks are of good shape and high quality. 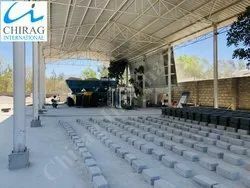 Chirag Multi Raw Material Brick Making Machines The moulds are changeable, and it is able to produce various kind of blocks,bricks,interlocks, pavers and kerbstones in different types, sizes, shapes, and colour layers. Chirag Powerful Performance Brick Making Machine for our esteemed clients. These machines are designed and developed in compliance with the industry standards. Chirag Powerful Performance Brick Making Machine Provided in varied models & designs, Fly Ash Brick Machines are also offered to clients at economical prices. 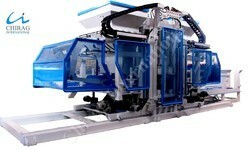 Looking for “Automatic Brick Making Machine”?